Chicago is a major transport hub in the USA and mobility is one of its vital economic drivers. In light of an estimated population growth of two million in the next decades, its infrastructure is in desperate need of improvement, calling for new investments such as raising taxes and introducing congestion charges. In order to highlight these issues at hand, the elaborately conceived and designed microsite aims to educate and influence policymakers, and at the same time raise public awareness on the topic. The website combines interactive 3D data visualisations, charts, time-lapse videos and aerial photography to tell a complete story of the issues but also of proposed solutions, clearly showing the complex development over time and impressively visualising it from various points of view. The design concept revolves around the idea of “zooming” in and out between macro and micro perspectives on the region. The macro perspective provides insight into major trends and challenges for the region, whereas the micro perspective shows the impact of these developments on its inhabitants and their everyday lives. 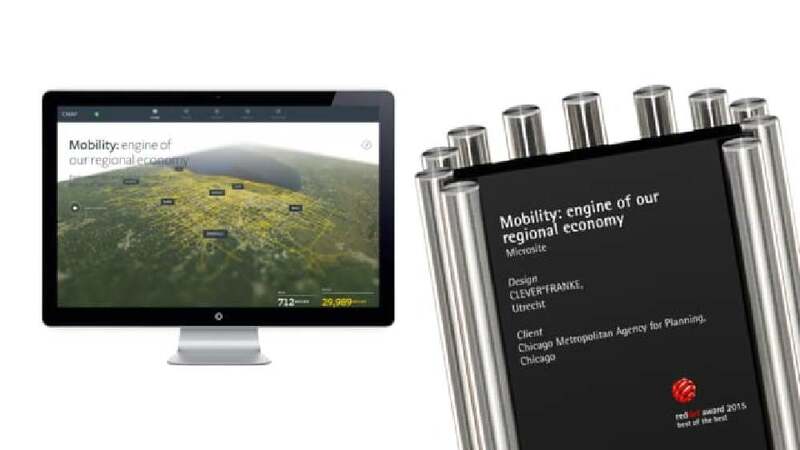 This microsite constitutes an outstanding solution to the task of visualising the complex issues of mobility faced by Chicago’s infrastructure and development from various viewpoints. The myriad of data is presented through rich images and in a visually transparent form so that the site not only succeeds in conveying the information in an appealing and captivating manner, but is also easy to navigate.